We made the move! We’re finally (pretty much) settled in to the house we’re renting and I’m so excited to finally share my next video with you guys. I was inspired to make this recipe because I’ve been considering going vegan again, but egg sandwiches are a staple in my diet. So I set out to make a vegan egg sandwich and let me tell you, this one does not disappoint! The key to getting that “eggy” flavor is Himalayan Black Salt, also known as Kala Namak. I bought some on Amazon but you also might be able to find some at a natural foods or health foods store. It has a very distinctive “eggy” smell (and taste) that comes from the sulfur compounds in the salt. A little bit goes a long way too, you only need 1/2 tsp for 4 tofu “egg” patties. To top it all off, these come together super fast. The only cooking involved is frying the “egg” patties for a couple minutes, so overall, these take only 15-20 minutes to come together. I added tomato and spinach to my sandwich which was delicious, but you can add your favorite toppings, or no toppings. 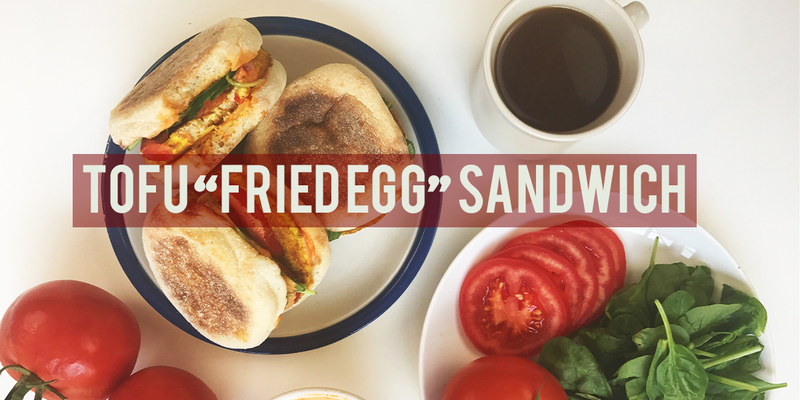 A delicious vegan version of a fried egg sandwich! Like an egg mcmuffin, but better..
1. Cut the block of tofu into 4 slabs, vertically. Using a mason jar lid or a cookie cutter, cut one circle out of each slab of tofu and dry both sides with a paper towel. Save the rest of the tofu for a stir-fry or other use. 2. Mix the salt, turmeric, nutritional yeast, and Himalayan Black Salt in a small bowl. Coat both sides of each tofu patty with oil and then a generous amount of the spice mixture. 3. Put a tablespoon of oil in a skillet and put on medium heat. Once hot, add the tofu patties and fry on both sides until golden brown. 4. While the tofu is frying, mix the mayo and sriracha in a small bowl and set aside. 5. 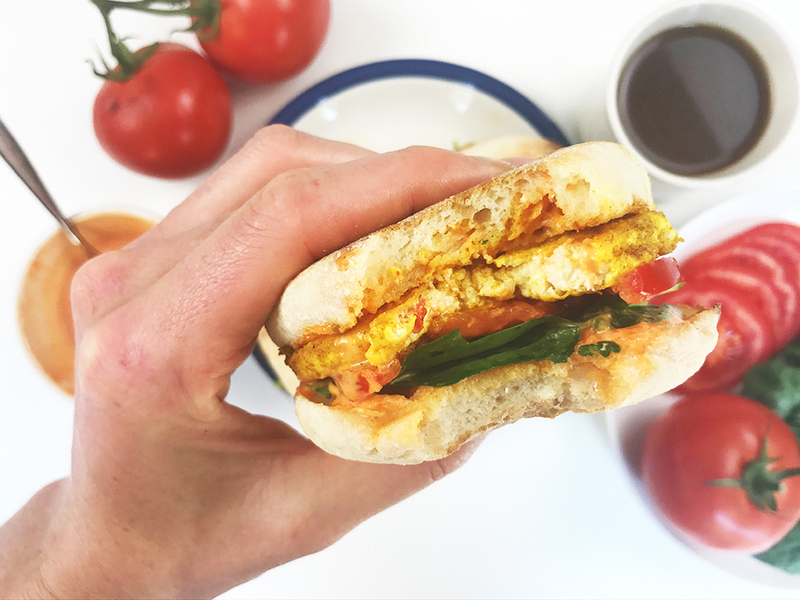 Toast the english muffins, spread sriracha mayo on both sides and add a tofu "egg" patty, a few leaves of spinach and a slice or two of tomato. Enjoy! *You can buy Himalayan Black Salt (also known as Kala Namak) on Amazon or at your local health food store. Hi! This looks great. About how long should I fry on each side in a ceramic coated skillet? I would say 3-4 minutes on medium heat!